Princess cut diamonds have become increasingly popular in the past few years. They are available in a square or rectangular shape and are listed as a square or rectangular modified brilliant on diamond grading reports. The jewelry manufacturer that I worked for at that time designed and manufactured jewelry pieces for Ambar Diamond, and it was part of the jewelry line that I carried when I was traveling out on the road as a sales rep for the company. Princess Cut diamonds generally result in a yield of 60 to 65% weight retention from the rough crystal. To put it in perspective, this is a significantly better weight retention than the about 50% yield for Round brilliant cut diamonds …. So, you know that cutters really love polishing them for bigger profits! Often, the octahedron shaped rough crystal can be sawn into half; yielding two stones from a single piece of diamond rough. The sawn surfaces then become the tables of the two resulting princess cut diamonds. This is why depth percentages of 70% to 75% along with large tables (70 to 75%) are quite common. In general, the weight distribution in these diamonds are in the vertical direction verses the horizontal weight distribution of other shapes. This means that if you have a 1.00ct. square Princess Cut diamond, it will measure about 5.45 to 5.60mm from side to side while a 1.00ct. Round Brilliant Cut diamond will measure about 6.45 to 6.50mm in diameter. Let me tell you that a 1.0mm difference in physical sizes can actually be very noticeable. Princess cut diamonds can be cut to much deeper proportions than round brilliant cut diamonds. This is why there is more weight from top to bottom andit will look smaller than other shapes with the same carat weight. AGSL (American Gem Society Laboratory) offers diamond grading reports with a “Cut” grade for this particular fancy shaped stone. This is a grade based on a measurement of the diamond’s optical efficiency by using ray tracing technology. This will help you know that a diamond is being cut as to maximize it’s light performance and it is something that can be measured and not just someone’s opinion. #1- I’ve seen some Princess Cut diamonds that have been cut in such a way that they have kept a lot of extra weight from the rough and as a result they are not very optically efficient. Table facets that are at 80% or more and extremely thick girdles are not uncommon with Princess Cut diamonds. If I were buying online, I’d look for an AGS diamond grading report with a Cut grade of “AGS Very Good” or better grade. If you are looking at a local jeweler, then comparing diamonds side by side should help you decide. Table and Total Depths can be up to the mid 70%s and no higher! No 80+% tables or 80+% total depths! #2 – I know a local diamond cutter that always has a small pile of Princess Cut diamonds that have been sent in to him from jewelers. The diamonds are in need of having the points recut in order to repair damage that had occurred during setting or in normal wear. The sharp, pointed corners do require great care when setting and need to be protected to avoid chipping or cracking. 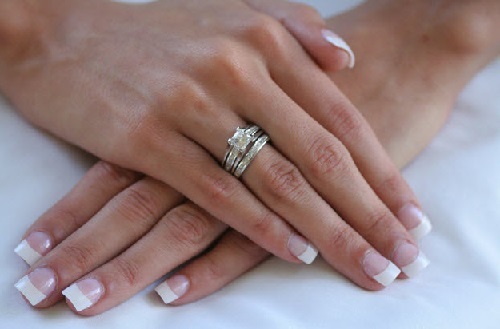 Always ensure that the setting (metal part that holds your diamond) protects the four pointed corners of the diamond…. this is normally a V-shaped prong that usually covers the corners. #3 – There isn’t an ideal length to width ratio that for Princess Cut diamonds. It’s largely up to personal preferences. If you want a square shape, look for a 1.00 – 1.05 to 1 and for a rectangular shapes, buy one around the 1.25 to 1 mark.